How Much Do You Cherish God’s Word? Sometimes hearing other people’s passion for God’s Word helps inspire our own. One person—William McPherson—had a commitment to Scripture that was remarkable. He was a Scottish quarry worker who came to America in 1893 and settled outside of Denver. A hard worker, William eventually earned the spot of quarry superintendent. Though he had a number of admirable traits, he tended to be a bit impatient at times. One day his impatience got the best of him and he grabbed a live stick of dynamite. It exploded while he was hovered over it. They were hours away from a doctor, but thanks to the efforts of his coworkers, he didn’t die. Unfortunately, though, the accident left him with no hands, little feeling in his face, and no eyesight. From that moment on, he was blind. Up to this point in his life he had lived for himself, reckless and free. Now, he was entirely dependent on others to help him get by. On several occasions before, others had tried to share Christ with him; now, due to his accident, he was in a place to listen. He gave his heart to the Lord in the coming months but was not satisfied by simply having someone read Scripture to him. He longed for the ability to read it for himself. His injury was taxing to those around him, though— emotionally, physically, and financially. Eventually, his family found themselves unable to take care of him so he entered a home in Illinois for the aged and disabled. Day in and day out he lived in darkness and solitude. He lived out the repetitive mornings, the same-song afternoons, and the identical evenings, armed with little more than his new- found hope in Christ. It was desperately lonely, and he had little hope that anything about his life would change until he died. At the nearby school, lecturers would come and speak about various topics that the people in the home were facing. One day he learned of a young blind girl who had learned Braille and was able to read her Bible with her fingertips. William couldn’t do this because the explosion had taken his hands. Over time, this young girl lost the feeling in her own hands and was distraught. She brought the Bible to her lips one day to kiss it goodbye, and to her amazement, felt something. She discovered that she could feel the raised letters with her lips! The story of this young girl had William pondering whether there was hope for him. He had lived in blackness for five years when God sent a blind girl named Anna Johnson to the home to work with some of the blind patients. Working with William proved to be frustrating, though: he had no hands, so conventional reading wouldn’t work. He had no feeling in his face, so the technique the little girl had adopted wouldn’t work either, although they tried many times. One day William asked Anna when she was about to go home for the day, if she could leave with him one of the little cards they had been practicing with. He kept trying to feel the little raised bumps with different parts of his body, when he realized he had not prayed and asked God for help. So he earnestly begged God for help. The next time he raised the card to his lips, his tongue slipped out and brushed the paper. To his astonishment, he could feel the raised letters with his tongue! He couldn’t wait for Anna to come back so he could tell her. With Anna’s help, William learned how to read braille with his tongue. In the 65 years that followed, and after much bleeding and soreness, William McPherson read the entire Bible four times with his tongue. I am absolutely blown away by this man. His example leaves those of us who can see with no excuse. God forbid we die and stand next to William in heaven, and we can’t say that we have read the Bible once with all parts of our body functioning properly. That would be a true tragedy. Then the next year came and on December 31, I went to Robby and I said, “If I die and stand next to William, he will have four and I have two.” It became a sort of benchmark for me, a small way to measure how devoted I was to spending time in God’s Word. I wasn’t rushing through, I wasn’t using Bible reading as a measure of my relationship, but rather as something of a barometer for my passion. By the end of the third year I could tell William if I saw him in heaven that I had read God’s Word three times through. Though that was a feat by itself, something even more remarkable had happened: I had cultivated a passion for the Word of God. As the years have gone on, I have learned that I don’t have to read the Bible in its entirety every year. It’s not about the quantity of Scripture we read, but the quality time spent in it. As my focus shifted from reading large quantities of Scripture to smaller, I’ve noticed that I now read “less” in order to digest more. But this is all just a part of my journey. If you have never read the Bible through, I cannot stress enough how enriching of an experience it is. You get a full view of the work that God has done in His people and see how His plan fits together perfectly—and continues to this day. If you’ve never read it through, it is never too late to begin. The Chicago Tribune published an article about William on April 27, 1913. In it, William commented that he believed that he was uplifted spiritually by being struck down physically. Though his vision was dark, his awakened soul could see beauties of life and the fullness of God. Sightless, he could see more than many blessed with vision. The Lord crushed him so that He might use him. God’s Word brought hope where there was once despair. 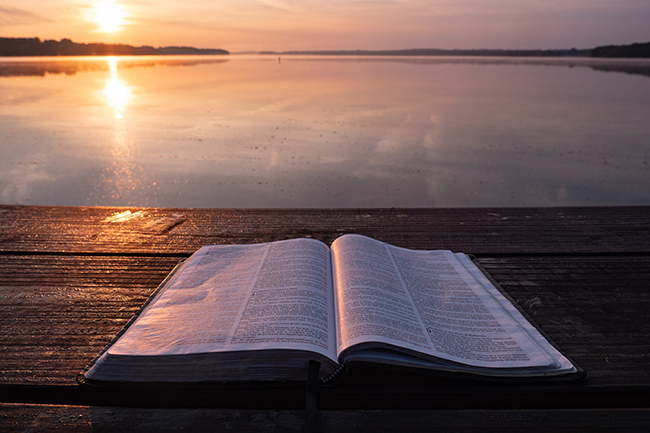 God’s Word reveals knowledge, wisdom, and truth for this life—the kind of Truth that will set you free. 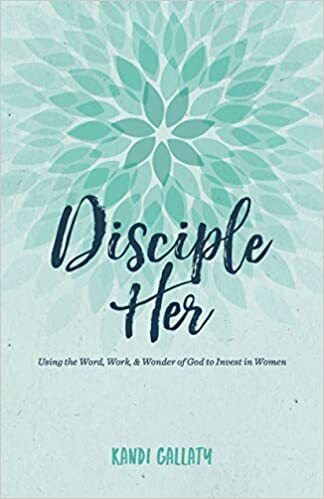 KANDI GALLATY (@KandiGallaty) is a trainer at Replicate ministries and the author of Disciple Her, from which this is excerpted with permission of B&H Publishing.